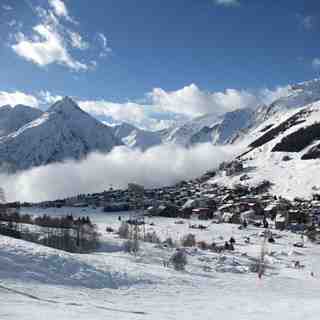 Is it snowing in Les Deux Alpes ?Merci! Like the name says, Les Deux Alpes resort is made up of two Alps, two alpine pastures put together over 50 years ago to form a ski resort. It shows how prescient the burghers of Mont-de-Lans and Venosc were; today 35,000 tourists at a time flock to the mile-high resort. 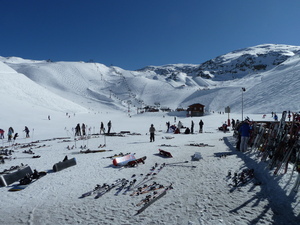 They come to enjoy the extensive, mostly treeless ski terrain, efficient lifts and lots of sun on south-facing slopes. 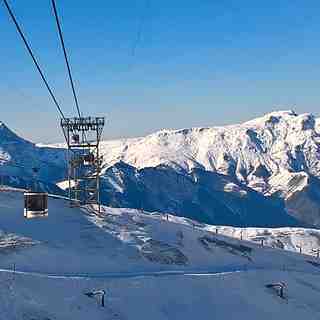 They ski on 220 km of groomed slopes at Les Deux Alpes, 20 percent of them black, and 44 percent intermediate and 36 percent easy. 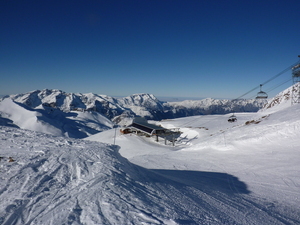 Les Deux Alpes has a top skiable elevation of 3600 meters and a vertical drop of 2300 metres are impressive statistics rarely found in a ski area. Snowboarders have a real chance to strut their stuff. In addition to wide-open spaces, shredders have a boarder-cross, fun park, and half pipe. Stout-hearted skiers have a mile-long couloir to jump into. 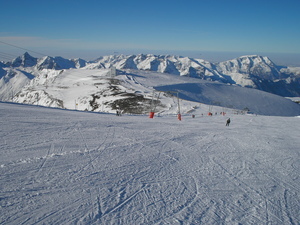 The Mont-de-Lans glacier at Les Deux Alpes, near the top of the main mountain, is claimed by the tourist office to be the largest skiable glacier in Europe. see http://www.snowangelnannies.co.uk for more information! Lifts are old fashioned and slow; way behind the times. No modern interactive ski maps of the hills. 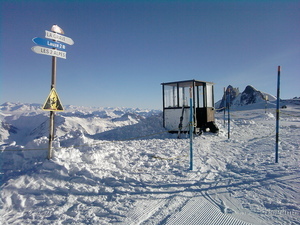 Skiing compared with other more modern joined up resorts: 5/10 overall.